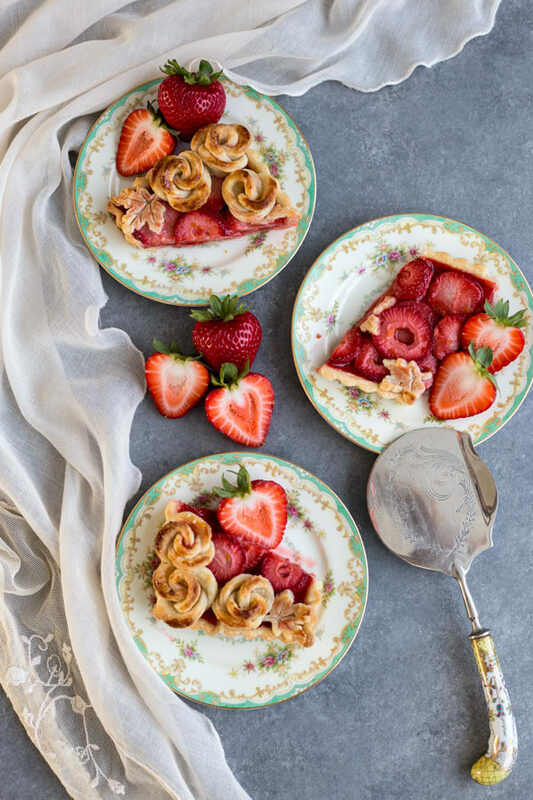 This gorgeous Strawberry Rose Tart is a lot easier to make than it looks. 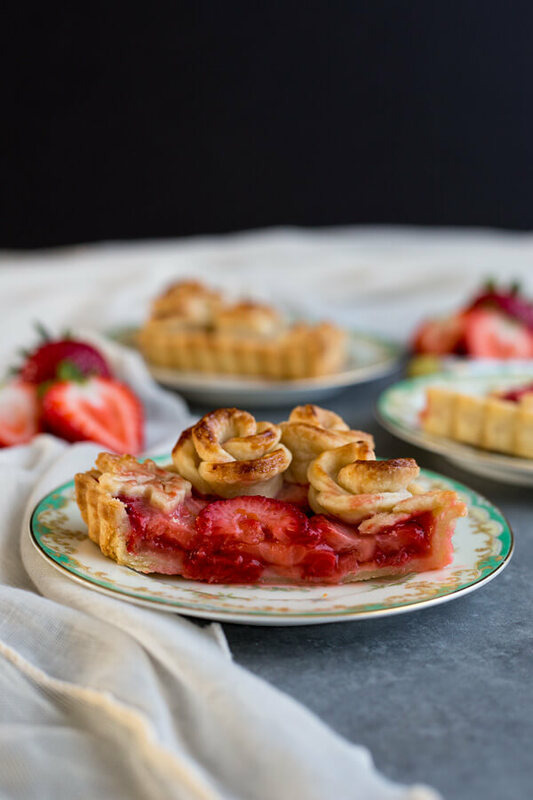 The orange strawberry filling is delicious, coupled with the buttery crust, this tart is a dessert made to impress. 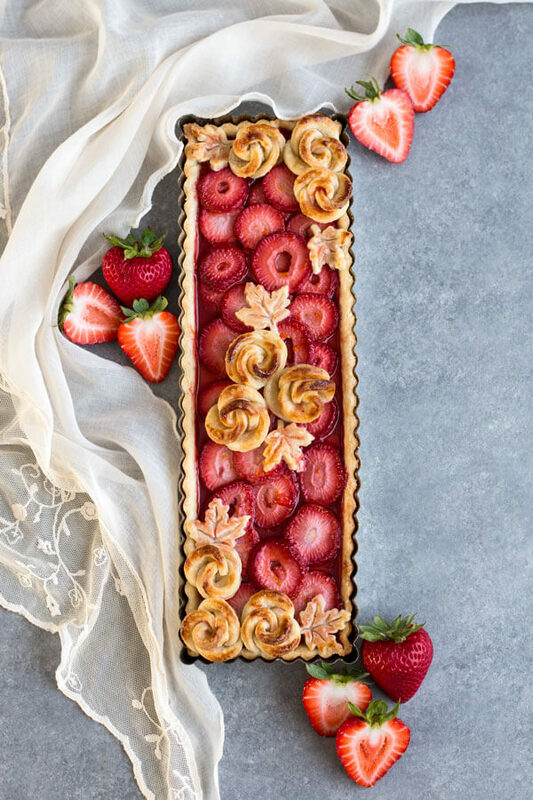 This delicious Strawberry Rose Tart is made with an orange infused strawberry filling and decorated with beautiful pie crust roses and leaves. There is no rose flavor in this tart in case you’re wondering. The “rose” in the name describes the cute little edible roses perching on top of the juicy layer of strawberry filling. To make the tart crust, you will need one recipe of my All-Butter Pie Crust. 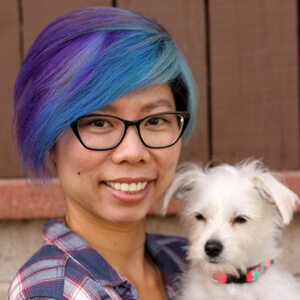 Refer to that post for more details and step by step photos. Once you have made the dough, roll it out as usual but into a rectangular shape to fit into a 4”x13” rectangular tart pan. 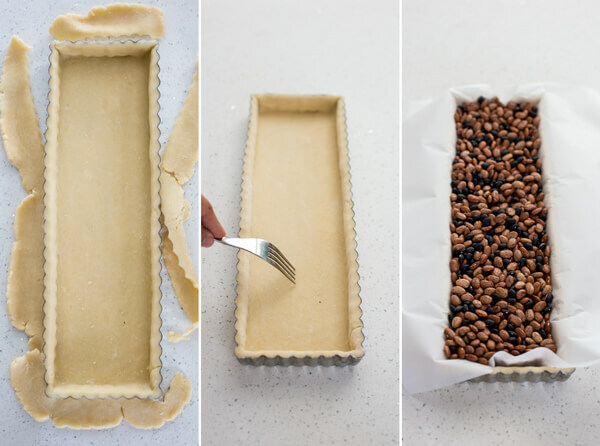 Then par-bake the crust, using dry bean a pie weights, to keep it from getting soggy when filled with fresh strawberries. Beside the delicious filling, the pretty decorations really take this tart over the top. You will need one half recipe of my All-Butter Pie Crust to make the all of the decorations. You can make more decorations if you wish or freeze the left over pie dough for another recipe on another day. 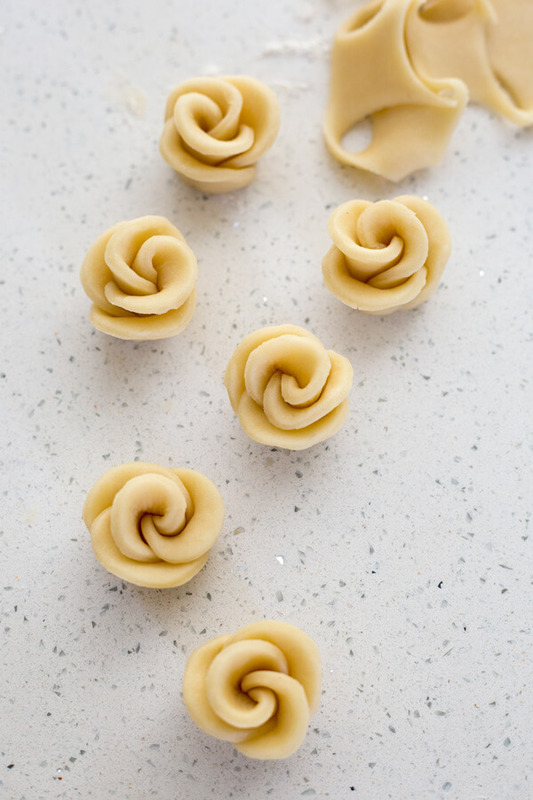 The pie crust roses are actually much easier to put together than they look. They are made out of 4 circles rolled together into a tube. Cut the tube in half crosswise, pinch the cut end together and flare out the petals on the open end to create the rose shape. As for the leaf cutouts, I used a maple leaf pie crust stamp. 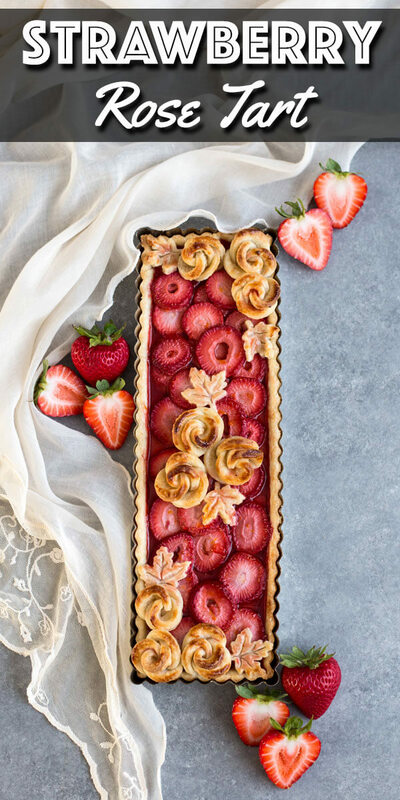 Once the crust is par-baked and the filling is prepared, all you need to do is assemble the tart, decorate to your heart’s desire and bake to completion. Allow it to cool before slicing into the tart. Repeat the steps above for the second pie dough recipe to be used for the decoration. Wash and hull the strawberries; cut into slices about 1/4” thick. 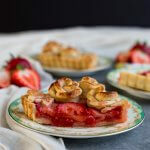 In a medium bowl, toss strawberry with half the sugar, orange zest and juice; let rest for at least one hour to extract some of the strawberry juice out. Take one disk of dough out of the refrigerator and roll into a rectangular shape at least 2” wider than your tart pan on each side. Place the dough over a 4”x13” rectangular tart pan, lightly press the dough into the bottom and sides of the pan, let the excess dough hang over the side. Press the rolling pin along the edges of the tart pan to take off excess dough. Poke the dough with a fork a few times, line with parchment paper and fill with dry bean. Par-bake the crust for 15 mins with bean, remove parchment paper and bean, bake for 5 mins longer. Mean while take the other piece of pie dough out of the refrigerator, cut into half, refrigerate or freeze the other half for another recipe or use. This will be enough for 10 roses and several leaves. 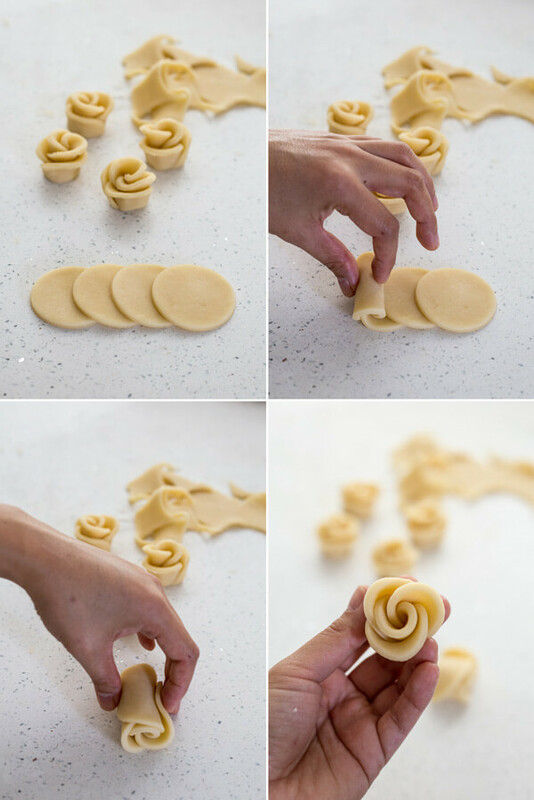 Roll the half piece of pie dough into 1/8” thick, cut into circles with a 2” cookie cutter. Place 4 circles in a line, each one half way on top of the other. Roll them up into a tube, cut the tube in half, crosswise. Pinch the bottom of the dough on the cut end. On the open end, flare out the petals to shape the rose. Each 4 circles will make 2 roses. Repeat the step above to make as many roses as you need. Use a leaf shape pie crust stamp to cut out the leaf decorations. Refrigerate all decorations until ready to use. Drain the strawberry juice and reduce to 2 tablespoon in a small sauce pan over medium heat, set aside. Add the rest of the sugar and cornstarch to the strawberry and mix well. Add strawberry slices into the cool par-baked crust; pour the juice over the filling. 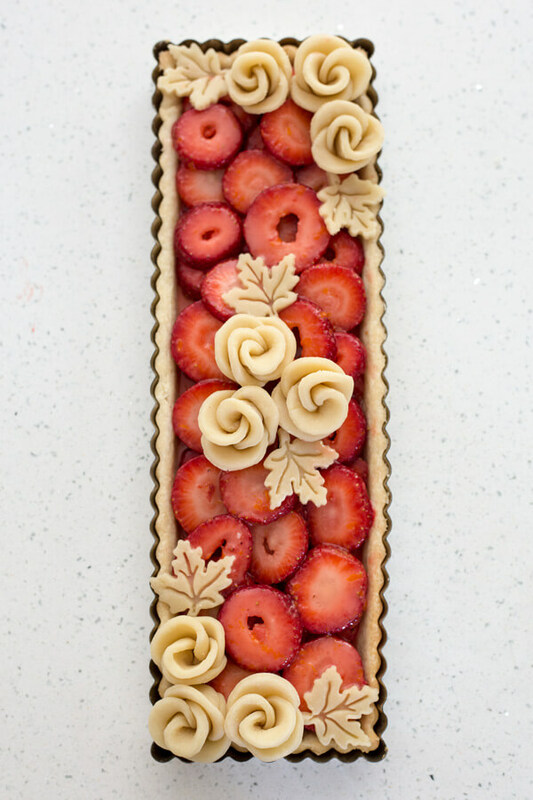 Add rose and leaf decorations in two corners and in the middle of the tart. Brush the roses and leaves with the reduced strawberry juice set aside earlier. 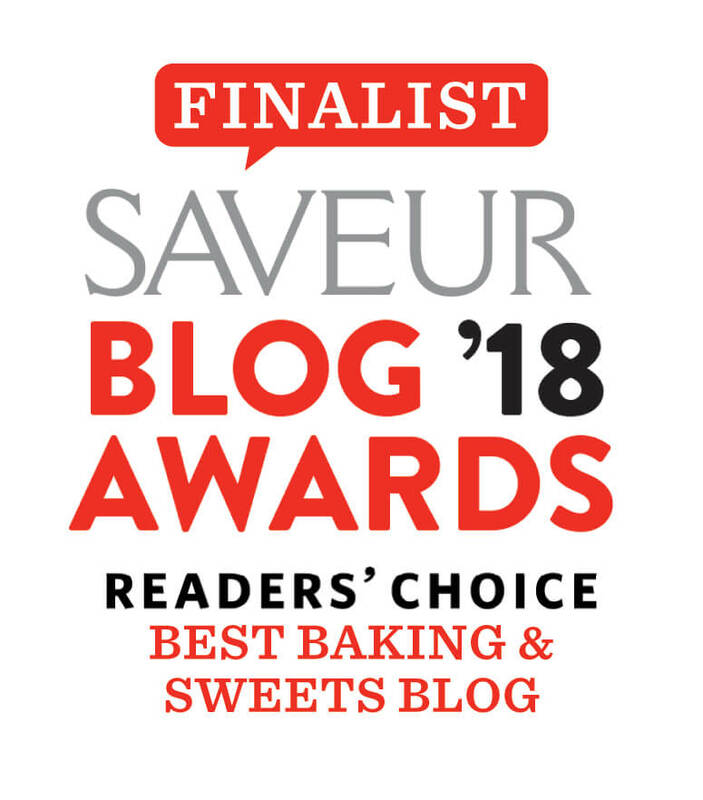 Bake for 22 minutes uncovered. This recipe requires at least one full pie dough recipe for the crust and one half pie dough recipe for the decorations. The ingredient list above include ingredients to make one recipe of pie dough. Double the ingredients for two recipes of pie dough. However, it is best to make them separately as the food processor will get too full.